Want to take a class in making the news more social? Here’s what you need to know. This post is intended primarily to provide info to students interested in taking J4700/7700, Participatory Journalism. NOTE: I will be teaching (via Skype) the classroom portion of this class for spring 2016. The Missourian is hiring a new director of community outreach, so we don’t know yet who the team’s newsroom boss will be. This class is about social news — about how journalism organizations can listen as well as talk, and how to invite interaction rather than just provide information. We think it’s important for people to see themselves in the journalism and easily find ways to get involved with it. It’s key to staying relevant as news providers. Luckily, the Columbia Missourian agrees. And as part of this class, you’d be joining the staff of the Missourian, on the community outreach team. Our team is constantly evolving. It’s a giant experiment. “Because we did it that way last time” is hardly ever a reason for doing it that way again. We’re continually assessing the effectiveness of what we’re doing, tossing out ideas that aren’t working and inventing new strategies to try (something journalists need to know how to do). Warning: As part of the team, you’d be assessed on how well you participate in and extend the experiment, not on how well you follow directions. If that sounds horrifying — if you prefer to stick with clear, comfortable instructions — this is not the class for you. Here’s a link to this semester’s syllabus (which is in a google doc because it’s always a work in progress. You can take a scan through the topics we cover and how you’d be assessed. Here’s a diagram I made of what we cover in the class. They report to the newsroom about what the community is talking about online and reflect community conversations out to readers. They create analytics reports for the newsroom. They learn not just about the tools of social media but how to be strategic about using them. (Read my rant about the lack of strategy in this post: Q: What “works” on social media? A: That’s a bad question.) Before deciding which platform to use and how, we’ve got to ask questions about our goals (crowdsourcing? lots of clicks? meaningful discussion?). They learn about how to invite the audience to become part of the conversation (offline and online) — and they experiment enough to learn why some invitations work and others flop. They manage a section of the Missourian called From Readers, where people are invited to tell their own stories. They ask where community members being social around the things we’re covering. Then ask: How can the Missourian be a part of that? In a fall or spring semester, you’d work 6-10 hours each week on behalf of the Missourian (much of it in the newsroom, some of it out in the community), and to some extent, your projects could be customized to your interests. Your newsroom hours would be during regular business hours Monday through Friday and could be worked around your class schedules and other commitments. But you need to have blocks of dayside time available. You’d also be on duty for some sort of coverage two or three weekends over the course of the semester. This class has typically also been offered in the summer. The newsroom experience is more intense and more condensed in the summer, as you might expect. It runs from May through July 4th, and you’d work 15-20 hours a week in the newsroom. You don’t need to have had the Missourian reporting class — just an equivalent class in your interest area. We’ve had students in magazine, convergence, photo, broadcast, agricultural journalism, strategic communication and print & digital interest areas. If you’re not sure whether your classes count, come see me. It’s okay if you’re working in more than one of our student newsrooms at a time — that’s not unusual on this team. Don’t have time for or interest in the newsroom work? There’s also a one-credit version of the class, J4152/7152. You’d meet once a week and get half the lectures, with no staff component. Ready for a consent number? Or have questions? You can find me here. Or ask one of the 95 former members of the community outreach team what they have to say about the class. I’m sure they’d be happy to speak their minds! You should take this course because the definition you have of journalism is probably way too narrow. That’s not your fault given what we learn in many courses — but think how much we limit ourselves when we consider only a TV package, inverted-pyramid story or radio report to be journalism. In this class, you’ll learn that journalism takes on all kinds of forms and that the process of news is almost as important as the product. Who’s to say the photos your neighbors took of their overseas trip aren’t journalism? What about the comment someone left at the bottom of the City Council story? And guess what: Facebook posts are useful for much more than sharing the link to a finished article. They’re great vehicles for finding perspectives to go INTO a story. Every time there’s a conversation — no matter the platform — there’s potential for journalism. J4700 will teach you where to find those conversations and how to extract the journalism from them. Joy Mayer’s Participatory Journalism class is the reason that I got a job a month after graduation. This class introduced me to the world of web and social media analytics, which then introduced me to my analytics capstone senior year. I now work as a Digital Product Analyst for The Gazette Company and I’m using every bit of analytics knowledge that Joy and Participatory Journalism taught me! I’ve never wanted to work for a big, huge newspaper. I’m from a tiny town of 2,000 and came to the journalism school with a passion for small-town community news and conversation. What I learned in Joy’s class, though, is that tight-knit, niche communities exist wherever I go. I just have to use my resources effectively to reach them. If you want to learn how to use technology to build a better presence in your community’s digital world, take Joy’s class. If you want to learn how to promote a better dialogue within your community outside of traditional reporting, then take Joy’s class. Take this class if you are passionate about the community you cover and if you want to be in a conversation WITH them and not just report it TO them. This class taught me to do better and more effective journalism no matter the scale. But be warned: This class ain’t for sissies. You won’t just learn how to play on Facebook. You’re going to have to work hard, experiment and step outside of the traditional reporting role. I promise it’s worth it, though. 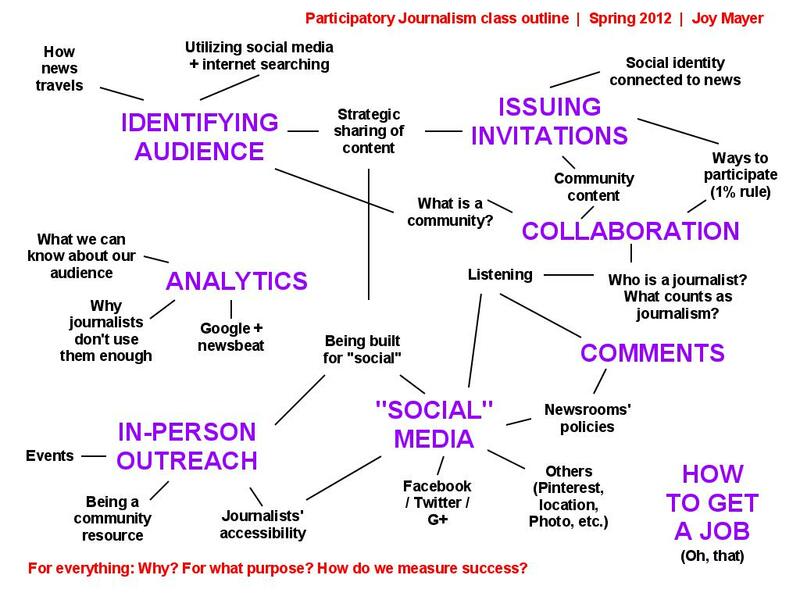 Participatory journalism not only taught me about community engagement in journalism, but also best practices when writing for social media and addressing the media landscape in its current state and as it evolves. J-School students in every emphasis area have something to learn from it, as learning the course content covering new platforms, online comments and more is integral to any student marketing themselves and the journalism they produce. This class challenges you to dream about what journalism could be. The outreach team thinks about why aspects of journalism are the way they are, and then experiments with ways to improve journalistic processes. “Can I pick your brain?” That’s a tough one. Local journalists, does your community see you as “the media”?